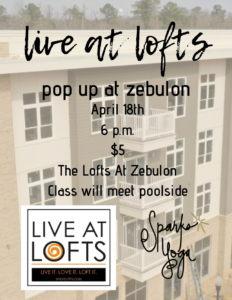 Join us April 18th at 6pm as we pop up at the Lofts at Zebulon!! This is an all levels yoga class, great for the beginner and the advanced! We will have surprise specials on classes, so don’t miss out!! Bring a mat and water. We have mats to borrow if you need one. We can’t wait to see you there!! Sparks Yoga offers AIReal Yoga™ and Traditional Yoga. We have state of the art AIReal swings and equipment, as well as infrared heating panels for our heated classes. Events and workshops are hosted regularly!